There are plenty of noteworthy restaurants in this city that that are worthy of recognition, but I chose an establishment outside of D.C. for the first time this month because the place I went to is just that good. 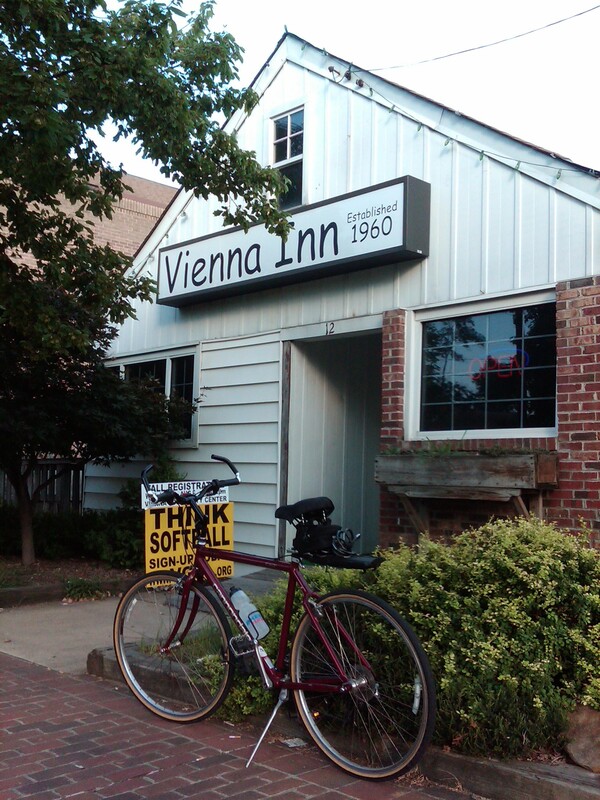 Located at 120 Maple Avenue in Vienna, Virginia (MAP), I rode to The Vienna Inn for lunch, and for February’s end-of-the-month restaurant review for this blog. 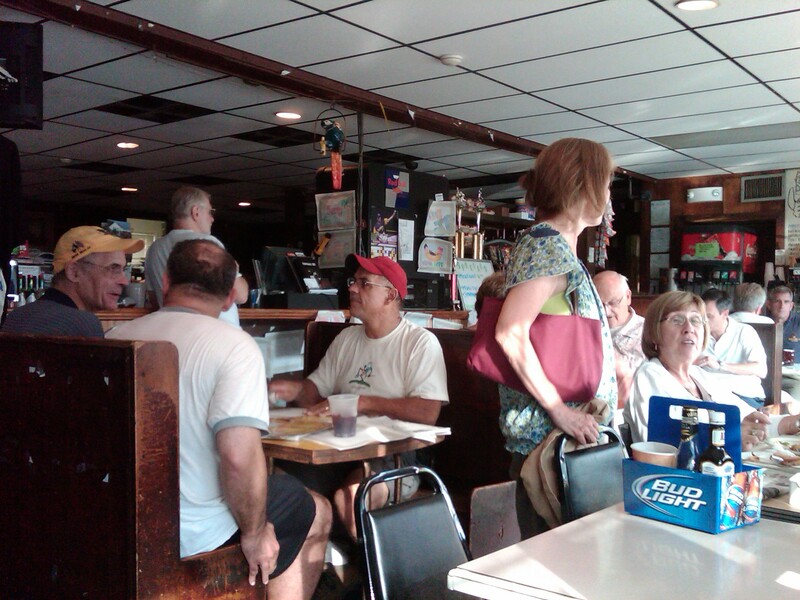 Draped in smoke and the aroma of chili dogs and beer, “The Inn” as it is often fondly referred to, has been a preeminent “dive” in the Northern Virginia area for more than half a century. Opened in 1960 by Mike and Mollie Abraham, the restaurant’s décor falls squarely within the category of “Restaurants That Time Forgot.” The classic neighborhood restaurant and bar has changed so little since it opened that one would be hard pressed to know what decade it currently is from its no-frills eclectic decor, which includes wood-paneled walls adorned with photographs and trophies from local area sports teams sponsored by The Vienna Inn over the years, as well as hand-drawn works of art from their youngest patrons, pinball machines in a corner, vintage booths and tables, all of which wobble and creak, and dim lighting that somehow just puts you at ease. And despite being sold by the Abraham family in 2000, current owner Marty Volk and manager Katie Herron have been able to maintain the same traditional laid-back and friendly atmosphere. Despite being a dive bar, The Inn enjoys the dichotomy of also being a family-friendly restaurant as well. Despite an always boisterous crowd, one of its main differences from other bars is that cursing is not allowed in The Inn – even if you’re a local icon, like Washington Redskins Hall of Fame running back John Riggins. There is a local story about John Riggins visiting The Inn one night and using profanity, at which point the whole place went quiet. After being appropriately chastised by the owner, he had to stand up and apologize to the crowd for cursing. At that point he was told that he could stay. The Inn is known for its chili, especially its ridiculously inexpensive chili dogs and French fries, which are my favorite. The fact that they sell more than 10,000 chili dogs every month indicates how good they are. But there is enough variety on the menu that there is definitely something for almost every taste. You can start off with their take on classic bar food and appetizers such as Buffalo Shrimp, Fried Red Chili Peppers or Boneless Chicken Wings. But don’t fill up too quickly, because the rest of the menu is not to be missed. You can enjoy lighter fare such as their soup of the day or a fresh salad. The Blackened Tuna Salad is particularly good. But if you’re hungering for something more substantial, classic comfort food such as meatloaf is always a good choice. As I said, their world famous chili dogs and fries are my go-to choice, but if you’re still looking for something else I also highly recommend any of their more than two dozen varieties of specialty sandwiches and burgers. And don’t forget breakfast. The Inn opens early, at 7:00am every day except Sunday, when they open at 9:00am. And it’s worth a separate trip for their extensive breakfast menu. They offer all the morning basics. But their offerings also include such diverse choices as Tex-Mex omelets, chocolate-chip hotcakes, cream chipped beef on toast, salami and scrambled eggs, and fat French toast. In my opinion, if you can’t find something you like on their menu, at breakfast or any other time of the day, then you’re either not trying or not hungry. Finally, adding to The Inn’s distinctive nature is the fact that it’s also a great haunt for area bike riders. I frequently enjoy a stop for breakfast while on a long weekend bike ride on the nearby Washington & Old Dominion Rail Trail, which runs through the town of Vienna and right past The Inn, which is located near Milepost 11.5. The bike racks out front serve as a welcome mat to area bike riders, but everyone is always welcome at The Inn. 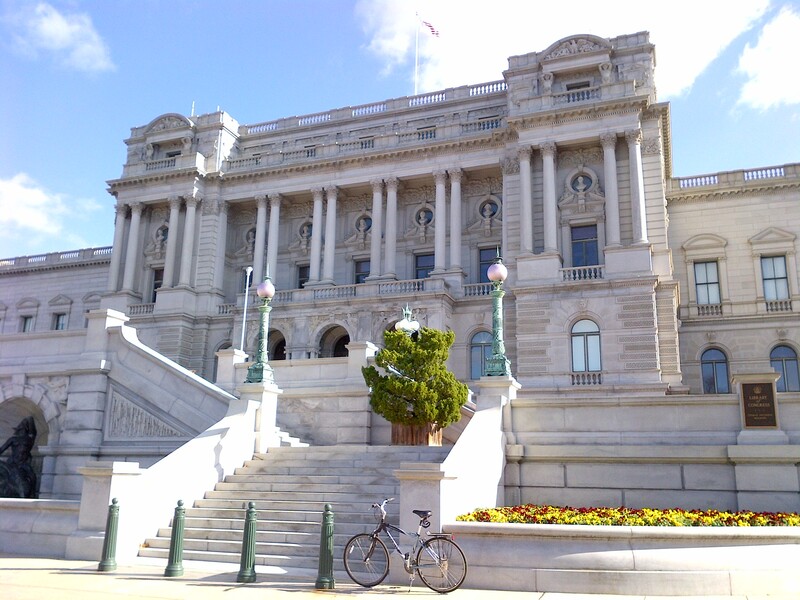 D.C. is such an unusual and interesting city that even after years of riding around it on my lunchtime bike rides I still look forward to what I might discover during my next ride. Two of my favorite types of discoveries are outdoor artworks and unusual vehicles. 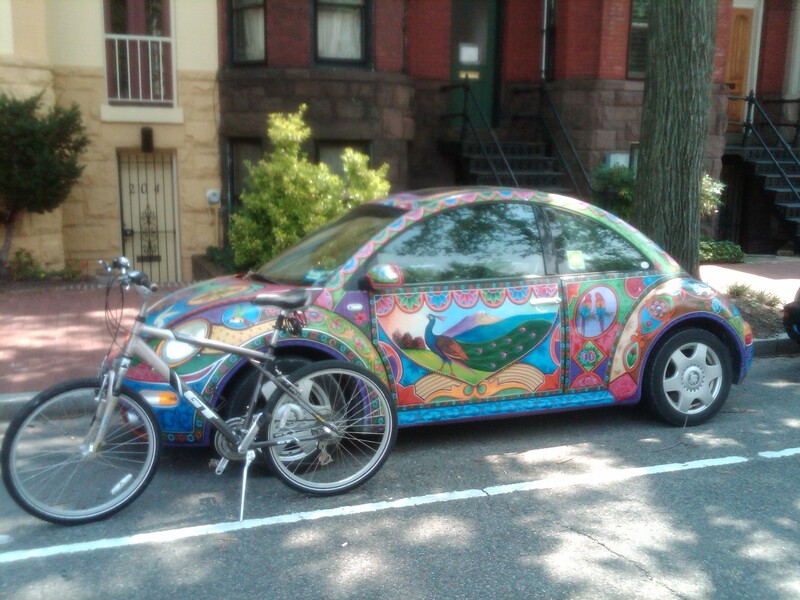 And on this bike ride I found both in the form of an elaborately-painted Volkswagon Beetle that I saw in the Capitol Hill neighborhood. The Volkswagen Beetle, or “Bugs” as we used to call them, was originally designed by Ferdinand Porsche, who in addition to the original Beetle also designed a number of different high-performance sports cars manufactured under the Porsche brand name, as well as the Mercedes-Benz SS/SSK. He designed the Beetle based on the exacting standards and at the request of Adolf Hitler, who was seeking a cheap, simple car to be mass-produced for the new road network of his country known as the Autobahn. However, World War II began the year following the development of the first Beetle, and mass production was put on hold. Thanks largely to the intervention of the occupying Allied forces after the war mass production began in 1945 when a British army Major, Ivan Hurst, was placed in charge of the Volkswagen factory. Volkswagen (which is literally “folks wagon” in German) Beetles would go on to be manufactured between 1938 and 2003, making it the longest-running and most-manufactured car of a single design. The classic Beetle was then redesigned and reintroduced in 1998 and is still be manufactured today. I think I can safely say that the unusual Beetle I saw while on this bike ride is fairly unique among the more than 21 million which have been built thus far. The multi-colored car I saw is festooned with elaborate depictions of peacocks, parrots and other exotic birds, as well as exotic flowers, all depicted together in an appearance reminiscent of the psychedelic counterculture of the hippies of the 1960’s, who were also partial to Volkswagen Beetles. So I guess there were a variety of people, from Hitler to hippies, who were involved in my being able to find and enjoy such an unusual piece of “artwork on wheels” during today’s bike ride. 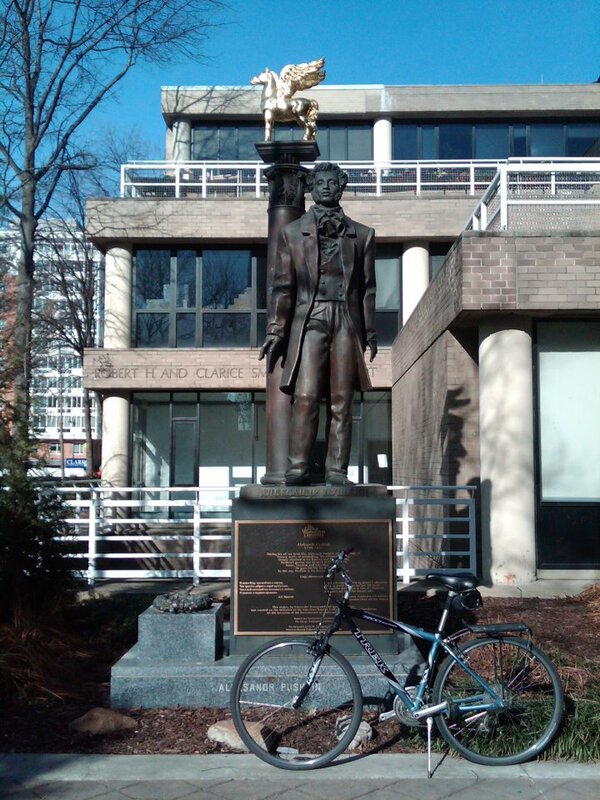 While on a bike ride on the campus of George Washington University I came across a statue of the Russian poet and author, Aleksandr Pushkin. This made me wonder whether or not there are any statues of American literary figures in Russia. Later, when I was trying to find out information about the statue from my ride, I got the answer to my question. The statue of Aleksandr Pushkin was a gift from the government of Moscow to the city of D.C. as part of a cultural exchange between the two cities. In return, a statue of American poet Walt Whitman was erected in Moscow. Located at the corner of 22nd Street and H Street (MAP), in northwest D.C.’s Foggy Bottom neighborhood, ground was broken for the statue on June 6, 1999, the 200th anniversary of Pushkin’s birth. 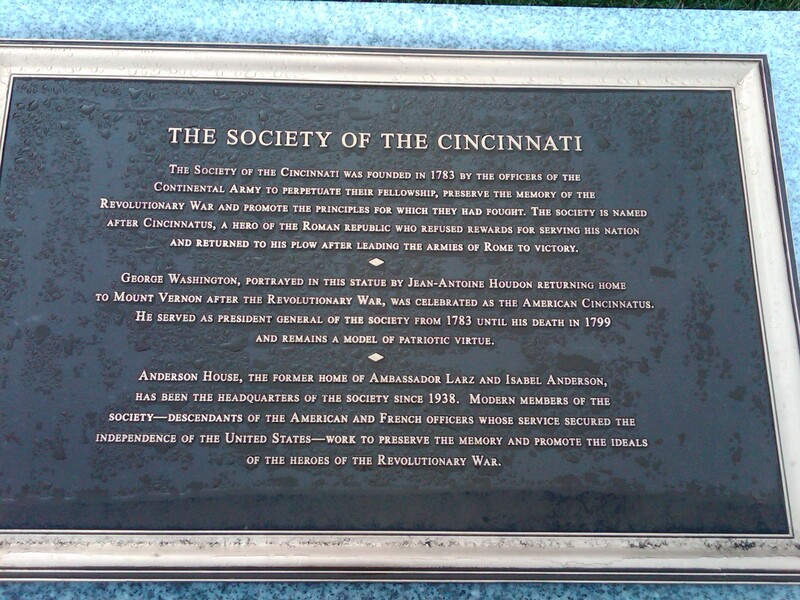 The statue was completed over the forthcoming year, and dedicated on September 20, 2000. It depicts the author in front of a column on which stands the winged horse Pegasus, symbolically representing poetry and creative inspiration. The Pushkin statue is thought to be the first monument in the United States which commemorates a Russian literary figure. Aleksander Sergeyevich Pushkin was born into Russian nobility on June 6, 1799, in Moscow. He published his first poem at the age of fifteen. And by the time he finished school as part of the first graduating class of the prestigious Imperial Lyceum near Saint Petersburg, his talent was already widely recognized within Russian literary circles. After completing school, Pushkin became committed to social reform and emerged as a spokesman for literary radicals. This angered the government, and led to his transfer from the capital. After five years in exile, he was granted permission to personally petition Tsar Nicholas I for his release, which was granted. However, some of his writings were subsequently found in the possession of radicals after the Decembrist Uprising in Saint Petersburg, and Pushkin quickly found himself under the strict control of government censors, and was again unable to travel or publish at will. But it was during this time that Pushkin wrote some of his now most famous works. Pushkin eventually was able to regain favor with the Tsarist government. However, many including Pushkin speculated that it was because of his marriage to the young Nataliya Nikolaevna Goncharova, who he had met when he was almost 30 and she was only 16 years old. Natalya had many admirers, among them the Tsar himself. Natalya accepted Pushkin’s marriage proposal only after she received assurances that the government had no intentions to persecute the poet. And later, when the Tsar gave Pushkin a court title, the poet became enraged, feeling that the Tsar intended to humiliate him by giving him the lowest court title solely so that his wife could properly attend court balls and events. By 1837, Pushkin was faced with scandalous rumors that his wife had embarked on a love affair. In response, the poet challenged Natalya’s alleged lover, her brother in-law Georges-Charles de Heeckeren d’Anthès, to a duel. Notoriously touchy about his honor, Pushkin fought as many as twenty-nine duels during his lifetime. The one with d’Anthès would be his last. Although the other man was injured, Pushkin was shot through the spleen and died two days later, on February 10, 1837. Although he was only 37 years old at the time of his death, Pushkin was somewhat prolific in his writing, particularly in comparison to more recent writers. He wrote narrative poems, verse novels, dramas, prose, and fairy tales in verse. And his writing is so complex that works which originally comprised only about a hundred pages would require two full volumes of material to translate and fully render its meaning in English. Because of this difficulty in translation, Pushkin’s verse remains largely unknown to English readers. However, in his native Russia he is considered by many to be their greatest poet and the founder of modern Russian literature. I doubt I will ever ride to Moscow State University in Russia to see the statue of Walt Whitman, which was unveiled by Secretary of State Hillary Clinton in October of 1999. Perhaps I will be able to read more about it someday from a Russian blogger. But there are places here in D.C. associated with Walt Whitman, who was a resident of the city for ten years. I plan to ride to some of those places in the future. Congress has the power to create, organize, and disband all components of the Federal government. But there is no complete official government list, and even experts can’t seem to agree on the total number of Federal government departments, agencies, commissions, offices, bureaus and institutes. Most estimates suggest there are probably more than two thousand, each with their own organizational structure and areas of responsibility and authority. However, their duties often overlap, making administration and keeping tracking of what your tax dollars are supporting even more difficult. 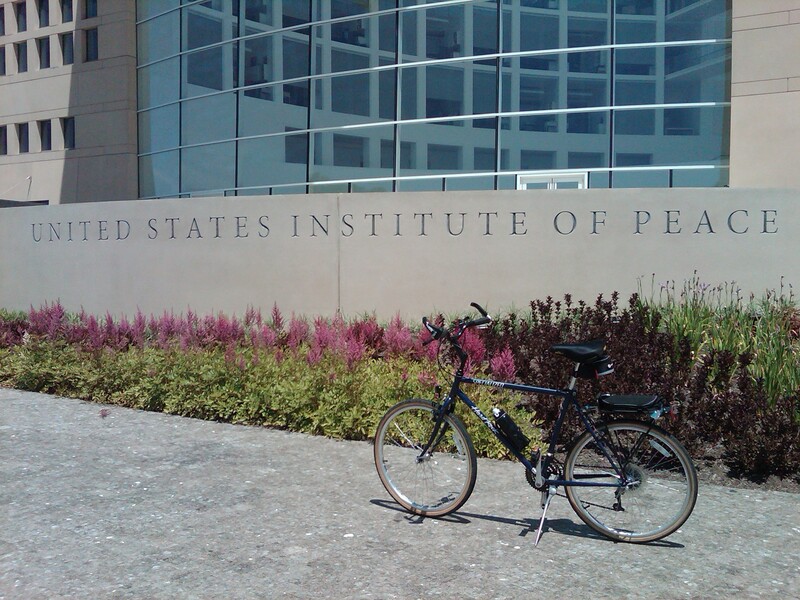 On this bike ride, as I was riding in northwest D.C.’s Foggy Bottom neighborhood, I happened upon a modern, glass-fronted building which upon further exploration turned out to be the headquarters for one of the Federal entities that I had never heard of before – The United States Institute of Peace. Located at 2301 Constitution Avenue (MAP), just a block west of The Albert Einstein Memorial, and near the northwest corner of the National Mall near The Lincoln Memorial, their headquarters is a LEED-certified building which was designed to house the Institute’s offices and staff support facilities, library, conference center, auditorium, classrooms, and a public education center, all while serving as symbol of this country’s commitment to peacebuilding. 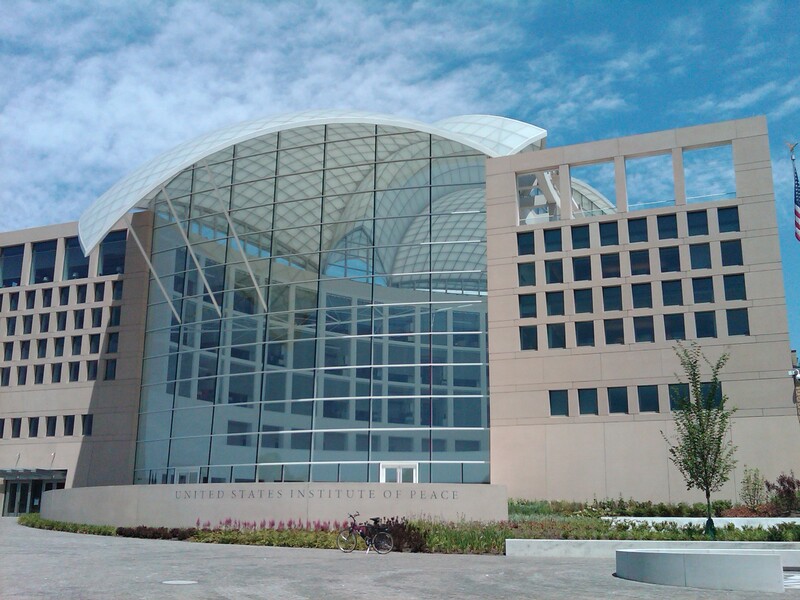 The United States Institute of Peace is a non-partisan, independent, Federal institution that provides analysis of and is involved in conflicts around the world. It is relatively new, having been established by an act of Congress that was signed into law by President Ronald Reagan in 1984. The Institute’s staff of approximately 275 is split among its D.C. headquarters, as well as field offices, and temporary missions to conflict zones. It is governed by a board whose members are appointed by the President and confirmed by the Senate. 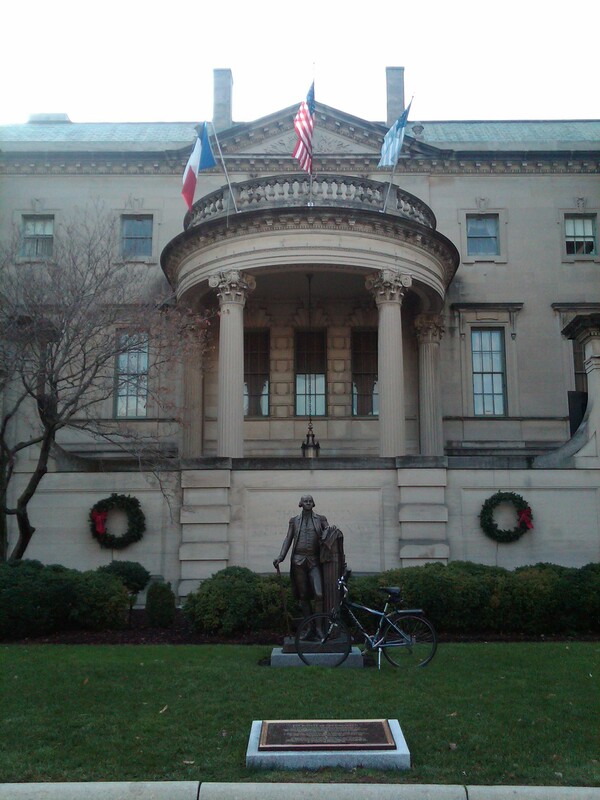 In this city that often seems to thrive on it, the Institute and its headquarters building are not without controversy. The Institutes board members have historically had very close ties to the American intelligence community, and the director of the Central Intelligence Agency may assign officers and employees to the Institute. And critics assert that the Institute’s peace research looks more like the study of new and potential means of aggression through trade embargos, austerity programs, and electoral intervention. Further, the Institute is funded annually by the U.S. Congress, and during its first 30 years its official funding has increased almost tenfold. However, it also receives funds transferred from other government agencies, such as the State Department, USAID, and the Department of Defense, making its actual operating costs unknown. The controversy and criticism of the Institute also affected the construction of its headquarters building. Officials broke ground for the new headquarters in June of 2008 at a ceremony that included President George W. Bush. However, by 2011 Congress voted to eliminate all funding for the U.S. Institute of Peace, including for the construction of its headquarters. 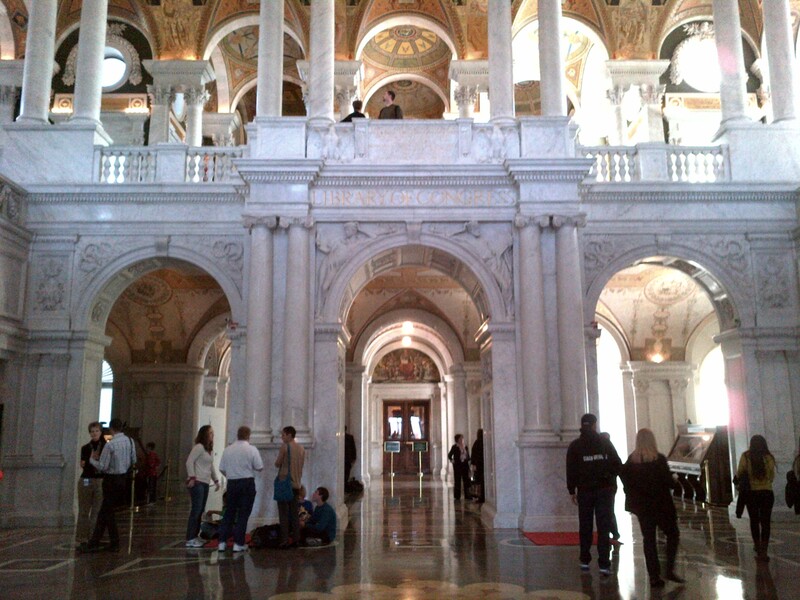 Funding for the building was eventually restored the following year by both the House and Senate. Additionally, the Institute is prohibited by law from receiving private funding and contributions for its program activities. However, the restriction on private fundraising was lifted for to construct the massive headquarters building which I visitied on this ride. With today’s post I mark the first anniversary of this blog. 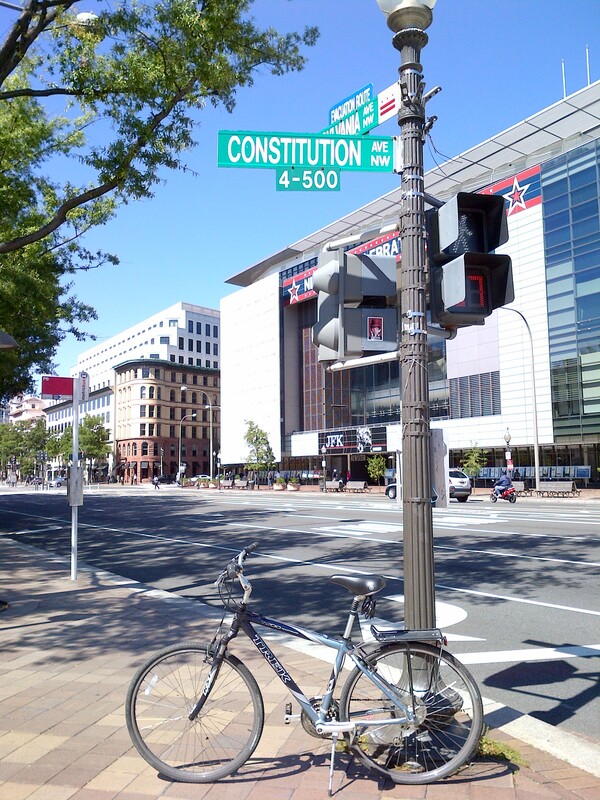 It was one year ago today that I got a bike from where I kept it in the parking garage of my office building, went out on my lunch hour for a bike ride down Pennsylvania Avenue and around the downtown area, and then posted An Introduction to Me and My Blog later that day. Since that time, I have written 266 additional posts about the places and events in and around D.C. that I have visited during my lunch breaks at work each day. I have been using my lunch breaks at work to ride around and explore the city for a few years now. But this is the first year that I have been writing about it. And I have found that adding the writing element has helped me enjoy the riding even more. By researching and organizing information about my destinations, and recounting and adding in my thoughts during the ride, I have been able to focus my attention, pay more attention to details, and better appreciate what I encounter when I am out on one of my bikes. 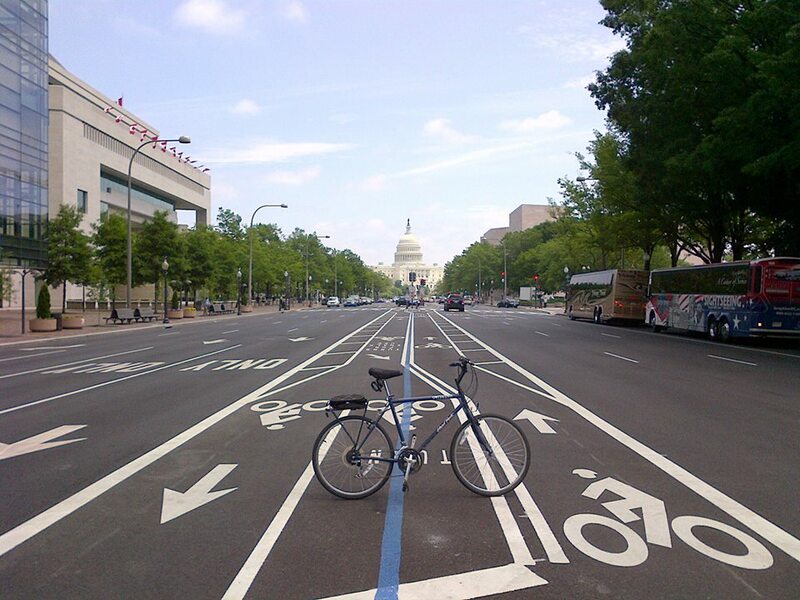 By this measure, I consider the first year of The DC Bike Blogger to be a success. The statistics provided by WordPress.com, which hosts this blog, also indicate that it has turned out to be a successful inaugural year. I didn’t have any specific expectations when I began writing about and posting photos of my mid-day explorations of the city. But if I had, I think those expectations would have been greatly exceeded by reality. I am especially surprised by the international representation among the blog’s readership. During this first year, The DC Bike Blogger has had readers from 91 different countries, including some that I had nevert heard of before. So I looked those countries up to find out about them. In order of the greatest number of readers, in the past 12 months the blog has been visited by readers from the United States, the United Kingdom, Canada, Germany, Australia, India, France, Brazil, the Netherlands, the Russian Federation, Spain, Italy, Indonesia, Belgium, New Zealand, Thailand, Philippines, Sweden, the Republic of Korea, Hungary, Ukraine, Bermuda, Japan, Venezuela, Mexico, Chile, Ireland, Romania, Bulgaria, Malaysia, Singapore, Honduras, Poland, Switzerland, Finland, Pakistan, Argentina, South Africa, Taiwan, Lebanon, Israel, Viet Nam, Denmark, Nigeria, Turkey, the Czech Republic, Greece, Kenya, Hong Kong, Peru, the former Yugoslav Republic of Macedonia, Norway, Colombia, Cambodia, Ecuador, Slovenia, Slovakia, the United Arab Emirates, the Occupied Palestinian Territory, Serbia, Estonia, Ghana, Croatia, Egypt, the Dominican Republic, Puerto Rico, Côte d’Ivoire, Cyprus, Austria, Guam, Bangladesh, Liberia, Portugal, Qatar, the Republic of Moldova, the U.S. Virgin Islands, Iraq, Chad, Malta, Sudan, Belarus, Albania, Jamaica, Saudi Arabia, the Bahamas, Jersey, Oman, Morocco, Latvia, Lithuania, Ethiopia, Costa Rica, Bahrain, Bosnia and Herzegovina, and Lao People’s Democratic Republic. However, there are currently 196 countries in the world. So, one of my goals for the future is to eventually have readers from the remaining 105 countries. By researching the places to which I ride, I’ve learned a lot during the past year. Even when it comes to places I thought I was already familiar with, I learned things I never knew before. In addition to the information about the destinations, I have also learned a lot during the act of riding to those places. During my bike rides I’ve had a lot of time for thinking and contemplation. And I’ve discovered that you can learn a lot about life from riding a bike. I’ve written down some of the things I’ve learned on a page entitled Riding Lessons, and these things are equally as important to me as the places and events about which I’ve learned. My plan for the future will be to continue using my lunch break to ride on every work day that I am able. I may venture out occasionally on the weekends as well to visit places outside of the city that are a little further away. However, I may not be as prolific in my writing during the coming year as I have been during this past year. I plan on focusing on destinations to which I have not yet been by identifying two, or sometimes three specific places to write about each week. On other rides I will simply enjoy the ride and the city in general. I think this will be a more realistic pace for me for ensuring a sense of balance with all of the other things that demand my attention and take up my time. Writing about two or three places per week will also establish a pace that will allow me to reach one of my original goals for this blog by the end of the coming year, which is to write 365 total blog posts, thus compiling a list of different places to go and things to see each day for an entire year. I then may try to organize it all into some sort of travel guidebook. I look forward to continuing to ride and learn and write in the coming year. I have already identified more places to visit in the future than the number of places I have already seen and written about so far. From the major monuments and memorials to the off-the-beaten path attractions, there is so much more to D.C. than most people think. And I plan to continue riding and then writing about what I see, what I learn, and what I think about while I explore this unique city, one bike ride at a time. On this lunchtime bike ride I did not go to see a monument or a statue, or any of the other usual types of destinations to which I normally ride. The destination of this daily ride was a book. This particular book has many stories about unusual and interesting things, including: a man who had seven hundred wives and three hundred concubines; a giant who had a bed that was 13 ½ feet long by 6 feet wide; a man who lived to be 969 years old; an army with seven hundred left-handed men; a man who had twelve fingers and twelve toes, and; a woman who boiled and ate her son. It even mentions unicorns. But the book is much more than a collection of interesting stories. The book is comprised of 1,189 chapters and was written by about 40 men on three different continents over a period of approximately 1600 years, dating from 1500 BC to about 100 years AD. It was originally written in Hebrew, Aramaic, and Koine Greek, and was not translated into English for more than thirteen centuries. It has now been translated into 2,018 languages, with countless more partial translations, and audio translations for unwritten languages and dialects, making it the most translated book in the world. But it is more than just an ancient book translated into a lot of different languages. The book is The Bible, and it was the first book ever printed. The Bible was originally printed in 1454 by Johannes Gutenberg, who invented the “type mold” for the printing press, a system of printing and typography that uses movable components to reproduce the elements of a document. And it was this Bible, an original, 560-plus year old Gutenberg Bible, that I went to see on this bike ride. It can be found in the Thomas Jefferson Building of The Library of Congress, which is located at 101 Independence Avenue (MAP), between First and Second Streets in southeast D.C.’s Capitol Hill neighborhood. Forty-eight copies, or substantial portions of copies of The Gutenberg Bible, survive. The Library of Congress copy is printed entirely on vellum, a fine parchment made from animal skin, and is one of only three perfect vellum copies known to exist. The others are at the Bibliothèque Nationale and the British Library. For nearly five centuries this Bible was in the possession of the Benedictine Order in their monasteries of St. Blasius and St. Paul in Austria. Along with other fifteenth-century books, it was purchased from Dr. Otto Vollbehr by an act of Congress in 1930. 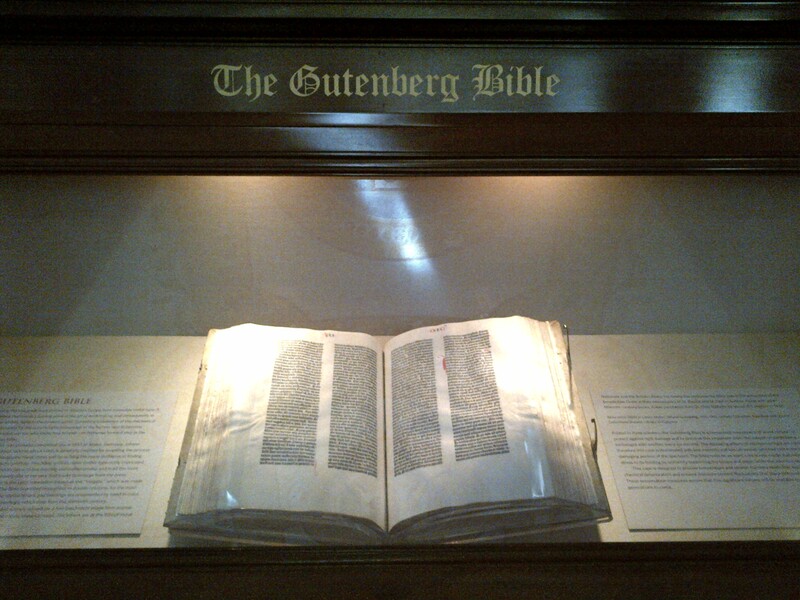 Gutenberg Bibles are considered to be among the most valuable books in the world. The last sale of a complete Gutenberg Bible took place in 1978. It fetched $2.2 million. This copy is now in Stuttgart. The price of a complete copy today is estimated to be between $25 to $35 million. The one I saw on this ride was not for sale, however, so I was unable to buy it. The one I saw on this ride was not for sale, however, so I was unable to buy it. Stonehenge is a prehistoric monument located in Wiltshire, England. It dates back to approximately 3100 B.C., and was constructed in three phases over a 1,500-year period. It is comprised of roughly 100 massive Bluestone, Sarsen and Welsh Sandstone boulders which were placed upright in a circular layout. And it has been estimated that the monument’s construction required more than thirty million hours of labor. Although it is one of the most famous sites in the world, it has puzzled historians and archaeologists for centuries. Many currently believe it to be markings of an ancient burial ground, however, speculation continues on what other purposes the megalithic monument may have also served. Theories for its design and the reason it was built range from astronomy, to human sacrifice, to a temple made for the worship of ancient earth deities. Although nobody knows for sure, only something extremely important to the ancients would have been worth the effort and investment that it took to construct it. Adding to the mystery is that scientists have yet to determine and how a civilization without sophisticated tools or modern technology – or even the wheel – produced the mighty monument built from stones, some of which weigh more than 40 tons each. Its construction is all the more baffling because, while the sandstone slabs of its outer ring hail from local quarries, scientists have traced some of the non-indigenous bluestones that make up its inner ring all the way to Wales, some 200 miles away. On this lunchtime bike ride I did not go to Stonehenge. That is because it is 3,591 miles from D.C., and my lunch break at work does not give me enough time to go all the way there and back. Besides, crossing the Atlantic Ocean on a bike is very difficult. But I did ride to a miniature replica which was loosely based on the original monument. 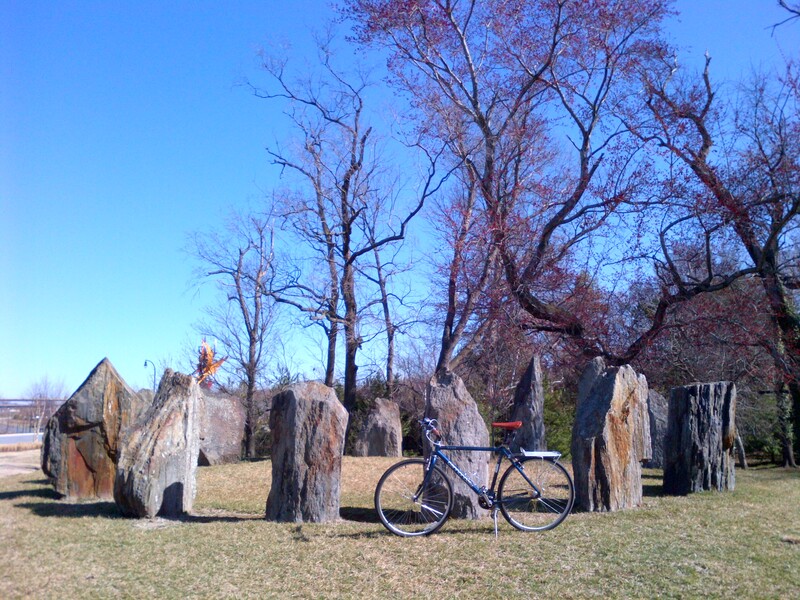 Located on a slight hill overlooking the entrance to National Harbor, near the intersection of Waterfront Street and National Harbor Boulevard in Fort Washington, Maryland (MAP), is a public art installation comprised of boulders arranged in a Stonehenge-like circular fashion. Very little information about the replica is available, giving it a slight air of mystery, much like its larger and more famous inspiration. But unlike the original, which receives nearly one million visitors per year, very few people, including those passing by it on their way to National Harbor, even know this stone monument exists. In addition to the distinction of remaining a resident of the National Capitol City after leaving office in 1921, President Woodrow Wilson also has the distinction of being the only President whose final resting place is in D.C. 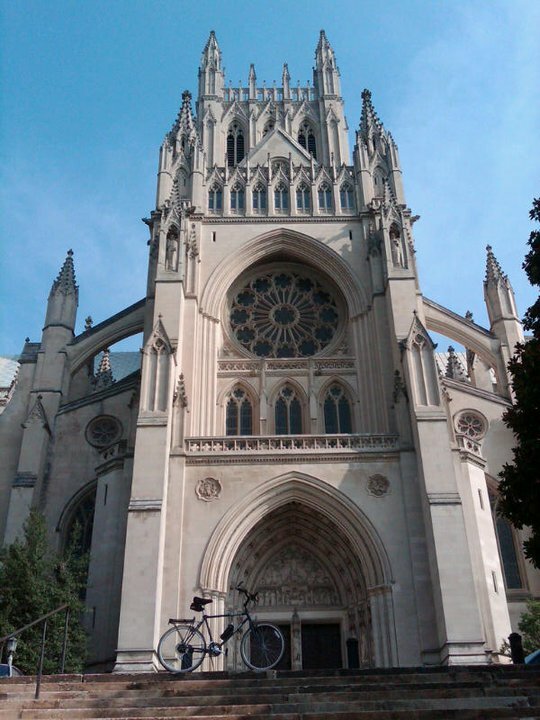 The 28th President is interred at Washington National Cathedral, which is located at 3101 Wisconsin Avenue (MAP) in northwest D.C.’s Cathedral Heights neighborhood. And on today’s 91st anniversary of his death, it was the destination for this bike ride. Thomas Woodrow Wilson served as President from 1913 until 1921. While still in office, President Wilson suffered a severe stroke in October of 1919, leaving him paralyzed on his left side, and with only partial vision in his right eye. This was compounded by the effects of a previous stroke he had while sleeping one night in 1906, which had caused blindness in his left eye. As a result, he was confined to bed for weeks and sequestered from everyone except his wife, Edith Bolling Galt Wilson, and his physician, Dr. Cary Grayson. As there was no clear constitutional precedent at that time for what to do if a president became unable to perform his duties, Edith Wilson effectively led in his place. Wilson served as President during a time prior to ratification of the 22nd Amendment to the U.S. Constitution, which limits a President to two terms in office. And had it not been for his significant health problems, he would have run and most likely been elected to a third term as President. But by the following year his disability had diminished his power and influence, and the Democratic Party ignored his tentative plan to run for re-election. Despite his poor health limiting the time he was able to serve in office, Wilson was not only one of the more effective Presidents in history, but one of the more interesting ones as well. In addition to being the only President to live in D.C. after leaving office, and the only one to make D.C. his final resting place, the following are just a few of the more interesting facts about him. Although he could not read until he was 9 years old and was mostly home-schooled, he went on to be the only President, so far, to earn a PhD. He went by “Tom” or “Tommy” for most of his life, and didn’t switch to going by his middle name until he headed off to law school, because he thought it sounded more impressive. 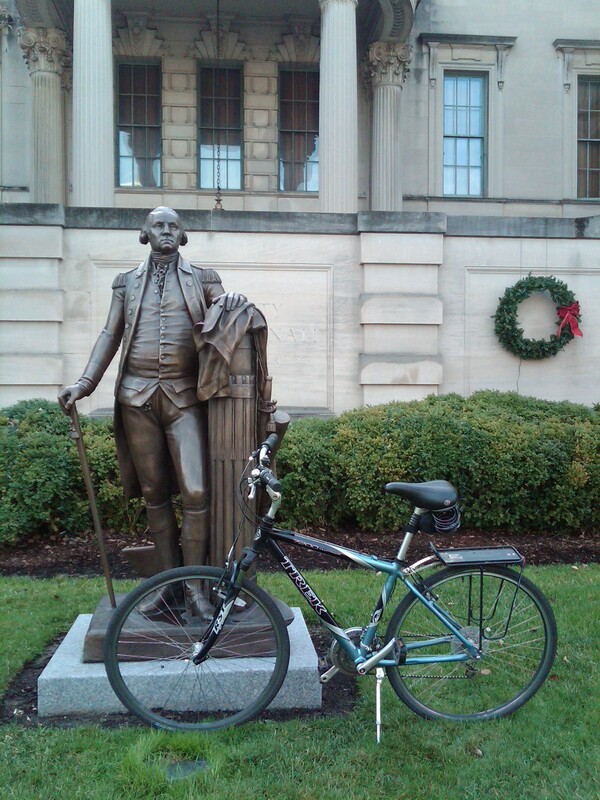 While living there, he was the first person to ride a bike in the city of Wilmington, North Carolina. Afterward he remained an avid bike rider. He was the first President to cross the Atlantic Ocean, as well as the first President to hold a press conference. He holds the record for spending more time outside the U.S. than any other President. Wilson was the first President to attend a World Series game, throwing out the first pitch of Game 2 between the Boston Red Sox and Philadelphia Phillies in 1915. Wilson holds the record among all U.S. Presidents for the most rounds of golf, having played over 1,000 rounds, or almost one every other day. As President, Wilson issued a declaration creating Mother’s Day. His nickname is Professor because he was one at Princeton, where he was voted as the most popular professor for six consecutive years before becoming President of the University. He was married twice, and his second wife was a direct descendant of legendary Native American Pocahontas. He let flocks of sheep stay on the White House lawn. And after running on a platform of keeping the U.S. out of World War I, and then leading the nation into the war, Wilson won the Nobel Peace Prize in 1919 for his efforts to avert future world wars. The Second World War would begin two decades later. And the last thing he said was his wife’s name, Edith. President Wilson retired in 1921, and he and his wife moved into an elegant 1915 town house on Embassy Row in northwest D.C.’s Kalorama neighborhood. Less than three years later, on February 3, 1924, the 67-year old former President died at home of another stroke and other heart-related problems. 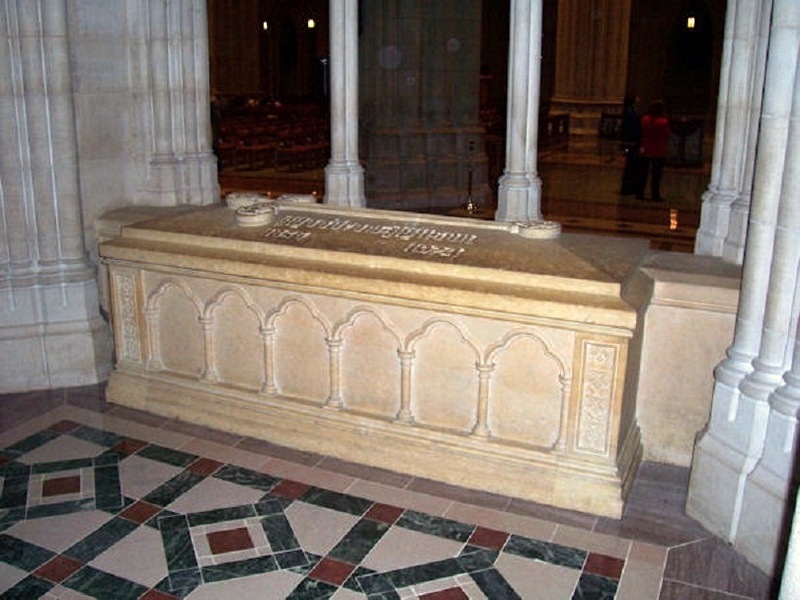 He was buried at the Washington National Cathedral, which was under construction at the time. Thirty years after his death his body was moved inside the church, where he was interred in a sarcophagus. Edith Wilson stayed in the home another 37 years, dying there on December 28, 1961, after which she was also interred at the Cathedral, below the tile in front of President Wilson’s crypt.